You need this 14-Hour course to meet the Core Law, Ethics and Specialty Credit continuing education license requirement for real estate sales associates and brokers. Enjoy a cruise, take a tax write off, and meet your state requirements (ask your tax adviser.) What could be better! Florida Real Estate University provides the core of your recurring education requirement, and adds new custom content – making the experience more interesting and relevant. Why cover the same old ground when you can learn something new and useful? Wouldn’t you rather get some new and interesting content in your class, instead of grinding over the same thing you learned two years before? Anyone who has ever had to sit through the same movie twice in a row knows that even if it is a decent movie, the experience can be tedious and tiresome. So let’s have a bit more fun! The Florida Real Estate Commission can make you attend training, but they don’t require that it is as boring as watching paint dry. Quality continuing education courses are not simply repeats of pre-licensing courses, they help develop your professional skills and awareness. This class is for those who need their 14 Hour Continuing Education. But it’s not just for you. Bring your family and friends! We meet your continuing education requirement in up to seven hours of instruction a day, but the remainder of the day and evening are yours to enjoy. Dreams come true. Create memories. Explore your world closer to home, and add the benefit of a stress free Continuing Education class. The Class is Free. Really Free. Continuing Education (CE) @ SEA is groundbreaking! Purchase the cruise, and the class (for up to two participants per stateroom) is FREE. This class meets Continuing Education for Florida Real Estate Licenses. When you take our CE @ Sea cruise, you pay a fair price for your cruise accommodations. Our CE cruises never hide higher costs in pricing; you get the best rate available while earning your CE @ SEA credit. Get to know other Real Estate professionals, both the learn how they approach their business and to build opportunities for referrals. Other professionals bring new perspectives to our classrooms and can open up new areas of discussion and offer their unique experiences. Let them broaden your professional horizon. Everything about our CE @ SEA class is designed for you to connect with family, friends and colleagues. Take the time to join us. All Inclusive cruise includes everything you need! What will it cost: TBA 2018. Contact us below for pricing. 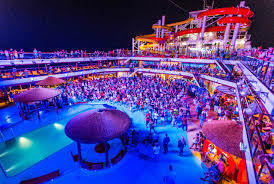 If you would like coordinate a group to take the CE @ SEA experience together, you may be able to get a FREE Cruise! Ask us how! 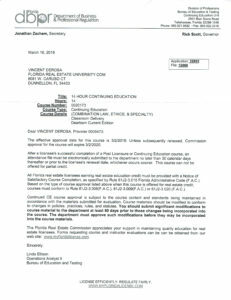 Florida Real Estate University is a Florida Licensed Real Estate School since 1980. Our instructors have provided Real Estate education for over 30 years, and have experience in many aspects of real estate brokerage, marketing, development, and transactions.